Update: This original Rife organism appears to be a necessary condition for cancer cells to survive. Eliminating this organism causes cancer cell death. There are many strains of this organism and it is very persistent. Research on cancer tumors using RNA sequencing of organisms identified Bacillus Licheniformis as the pleomorphic organism that has been discussed by scientists since the 19th century. This finding was published in LANCET oncology in 2003. Rife enthusiasts are still debating about whether Bacillus Licheniformis is the organism Rife identified with his extraordinary microscope in the early 20th century. However, they have no DNA or RNA sequencing evidence to support their arguments. 100% of people I have tested with cancer are infected with the Rife organism. Also, 100% of the people I have tested who have taken probiotic supplements containing Bacillus licheniformus have tested positive for Rife organism. British scientists recently reported in Lancet, that they DNA sequenced the Rife BX, BY “virus”. What appears to be the Rife “filterable bacteria” was isolated and each of the various forms of the organism has the DNA sequence of Bacillus licheniformus, a pleomorphic organism that appears as rods, cocci, and fungus-like forms. Rife had a very difficult time culturing this organism in the 1920’s and people have had limited success since then, so demonstrating non-contaminated multiple forms of the same organism with exactly the same DNA sequence is a major accomplish that could end decades of controversy. Sansom, Clare. “Cancer Germ” Bacteria Isolated. THE LANCET Oncology, Vol 4 February 2003, p. 63. “A bacterium from canine mammary tumours which has many similarities to bacteria reported in studies done as far back as the nineteenth century has been isolated by a researcher in the UK. “The hypothesis that bacteria may be implicated in cancer development has a chequered history. In the late nineteenth and early twentieth centuries, scientists isolated several species of bacteria from tumours, which they believed to cause cancer. By the 1950s, this “cancer germ theory” had fallen completely out of favour; modern interest revolves around the widely studied link between Helicobacter pylori and stomach cancer. “Milton Wainwright (University of Sheffield, UK) isolated the bacterium on nutrient-free silica gel to reduce contamination. He discovered that the isolate grew in different forms, including short and long rods and cocci. After extended incubation on Czapek-Dox medium, it produced a branched, filamentous form that superficially resembled a fungus. 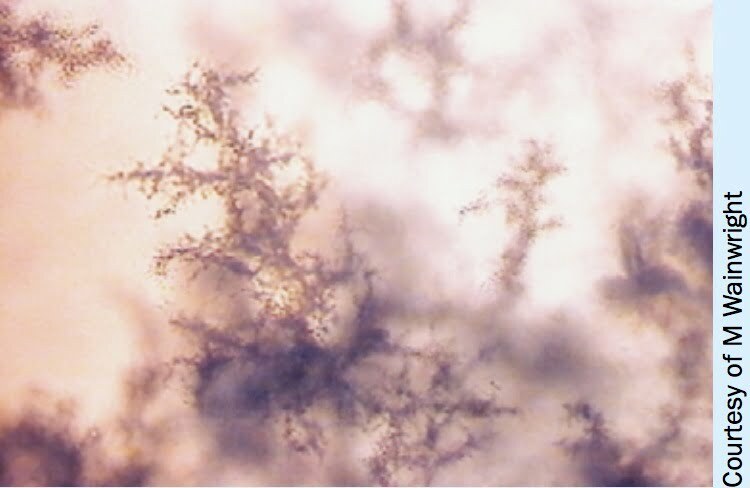 Fungal contamination was initially ruled out by proving that the colony did not respond to non-specific antifungal antibiotics. Milton Wainwright had already published data previously showing bacteria can pass through very small holes (as noted by Rife) and that this has major implications for their role as pathogens. See: Med Hypotheses 2002 Jun;58(6):558-60. The first step in dealing with cancer electronically must be to eliminate all Bacillus lichenformis from the body as it appears to be both a tumor promoter and a mutagen. Tumors will tend to grow or recur with this organism present. Infected individuals should run this F100 program weekly for as long and as often as it takes to eliminate any detectable Bacillus licheniformis. Multiple treatments will be required as this is a very persistence organism.